Many years ago the Government sold the Imperial Mining Company mineral rights to the Omovodo Range, a series of small mountains in the far north. At that time there was nothing to be found there but some poor-quality iron deposits, recently extensive research by IMC has found that the area contains vast, rich fields of diamonds. The IMC has quietly been developing the infrastructure to begin exploiting the resource but word has gotten out (it always does) and the Government has demanded a re-negotiation of the terms of the mining rights contract and has threatened nationalization. Needless to say the IMC is not happy about this development and has "taken measures" to ensure the security of their investment. The government, always looking for a foreign "boogey-man" to rabble-rouse against, has mobilized the army nearby citing "rising unrest" in the area and the need to "secure the national endowment". Rumors abound of mercenaries and military equipment moving into the area from surrounding nations, the powder keg has been opened and only awaits a spark. A view from the north, the sawmill in the center lower edge. The sturdy brick building in the center is the IMC offices, the large building on the right is the electrical generating plant. The action begins, Blinds are deployed. The IMC seems to have a distinct numerical superiority. 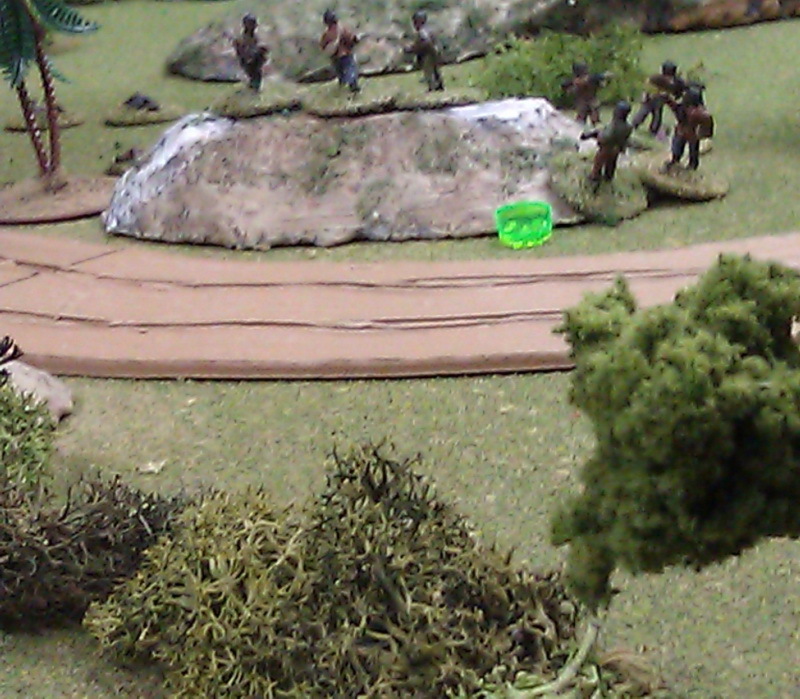 At the Government end of the table, looking west, the troops begin to move off-road. The elite Guards troops press on up the road as the rest of the army fans out across the fields looking for the "insurgents". At the IMC end of the table, the mining company's representatives spread out eastward. The Blinds with the green chips and dice are "holding over their actions": an interesting rules device that allows you to reserve actions for later use...a sort of overwatch. The Government Blinds deploy: one turns out to be a T-55, much to the IMC's dismay. But they had little to fear as it was unable to spot the Blinds in front of it. A technical (in the distance next to the sawmill) opens fire on Government troops moving toward the sawmill. It receives fire in return. This firefight would go on for a rather long time. The Guards dismount from their APC. Note that the better trained troops chose to fight in the shade. The sawmill was teeming with angry "workers". It quickly came under fire (signified by the green skull marker). 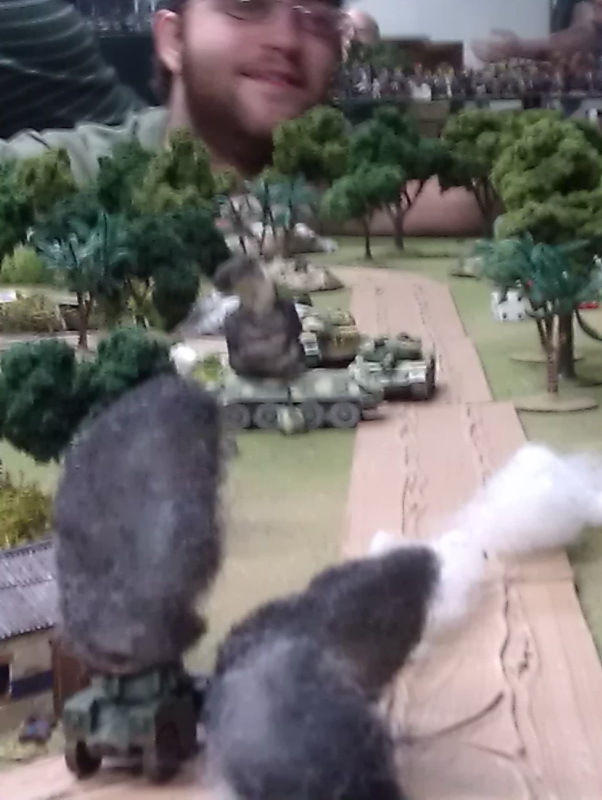 The T-55 opens fire on an IMC armoured car but misses. The troops, having tired of the technical's fire, take a shot with an RPG. It missed. The T-55 to the rear continued missing the armoured car, and the one in the foreground reserved actions in case the pig farm was occupied by rebels. The T-55 misses the armoured car for a third time. Finally the armoured car is destroyed, but not by this T-55. Back at the sawmill, the IMC forces maintain their foothold despite casualties. Another shot with an RPG hits the technical, killing the crew, but somehow leaving the vehicle in operating condition. Lending a hand to it's "accuracy impaired" brother, the lead T-55 takes out the armoured car at last. The Government forces take control of what was soon to be named the Hill of Blood. The T-55 finds gunning down IMC forces a lot easier when they are not hiding behind a hill (or in an armoured car). The Guards continue to advance on the pig farm. Government forces in the center and middle distance pound the sawmill with fire but are unable to break the will of the stalwart IMC workers. 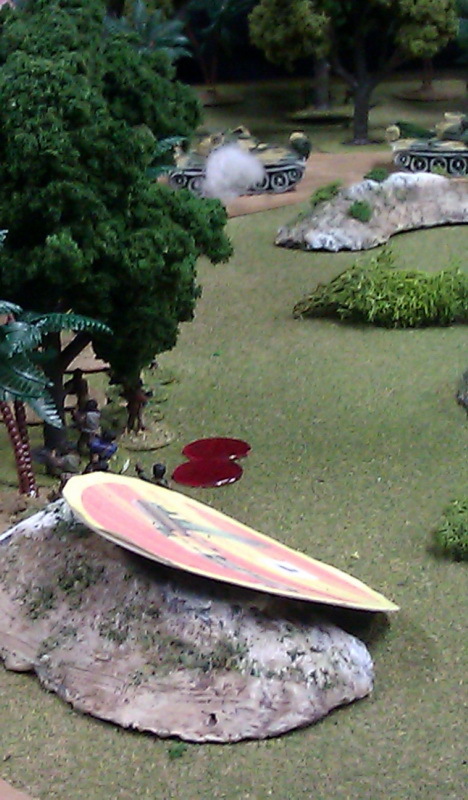 The IMC troops hiding in the trees return fire with an RPG: it went wildly astray. The Guards gain control of the pig farm. 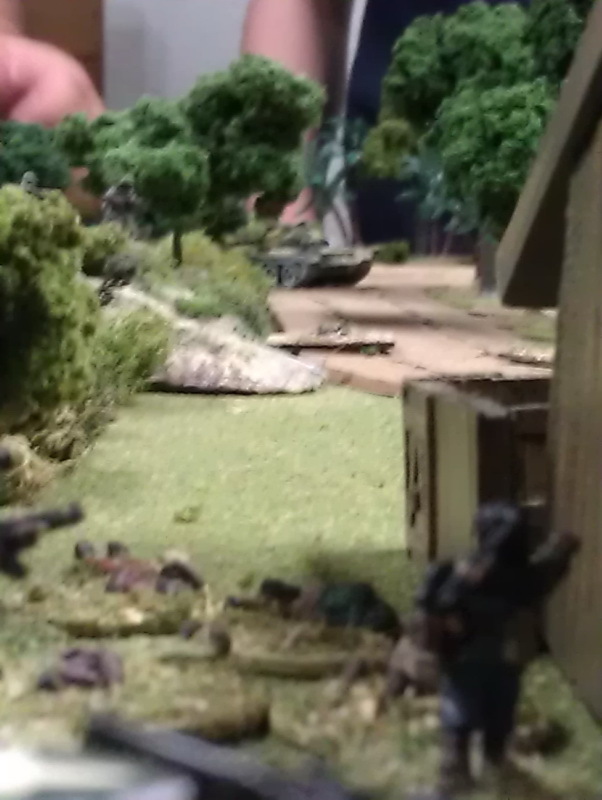 The tanks are joined by the BDRM of the Guards as they fire upon the IMC troops in the woodline. The carnage in the sawmill is frightful but still the IMC workers stand fast. But the damage is not isolated to the IMC forces: the Government troops on the Hill of Blood have been pounded hard as well. Taking fire from multiple directions the rebels in the tree line gamely fought back, but the level of damage was rapidly becoming intolerable. But the IMC was not without a surprise or two of it's own. Two gun-armed armoured cars came off Blinds and took the BDRM under fire: destroying it and driving one of the tanks off as well. In return they came under RPG fire from the Guards. This resulted in the immediate complete destruction of one of them. The resulting ammo explosion caused civilian casualties. More Government forces advance to drive off the stubborn rebels in the tree line. The tanks notice the destruction of the BDRM and will have to break off firing at the rebels in the trees to deal with the armoured cars. 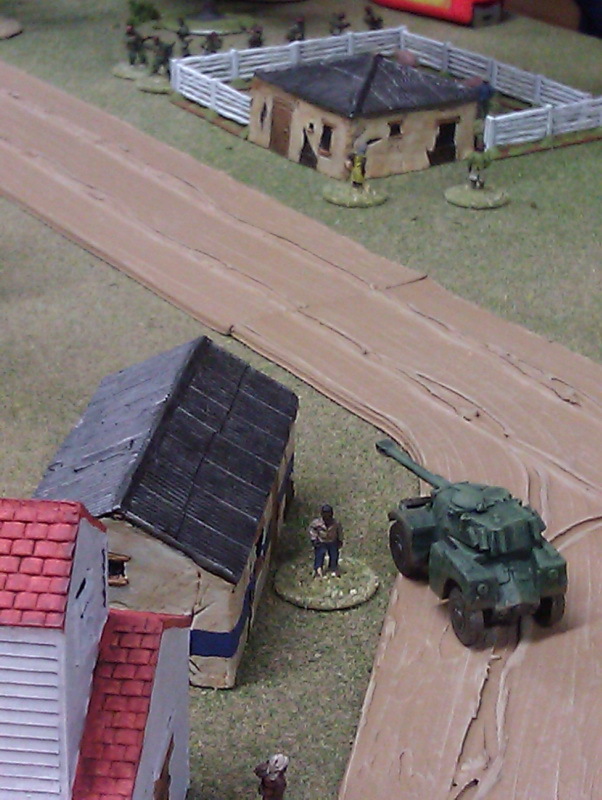 The Government troops begin to lose the fight with the re-manned technical. The IMC forces still hold forces under Blinds, causing the Government commander great concern. With the rebels finally losing grip on the tree line the Government forces can advance. 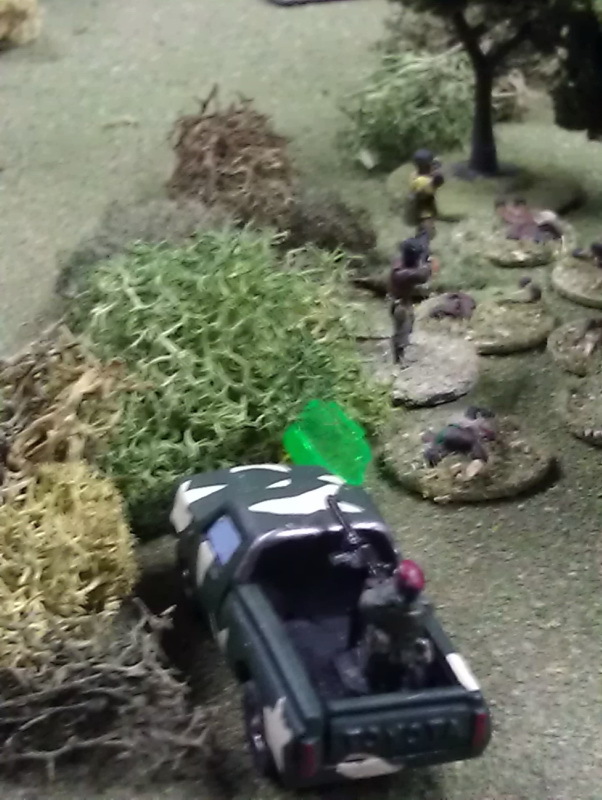 The heroic rebels retire past the wreckage of their armoured car. The squad of Government troops on the Hill of Blood also could no longer stand the fire and withdrew. They rallied a short distance away but badly needed to re-organize. Hammered by fire from the technical and a squad of rebels next to the sawmill, the Government troops are on the edge of collapse. A T-55 decides to lend a hand with the stubborn sawmill, only to be taken under fire with RPGs. Meanwhile, back at Emmetsville, the second armoured car falls prey to persistent enemy action. 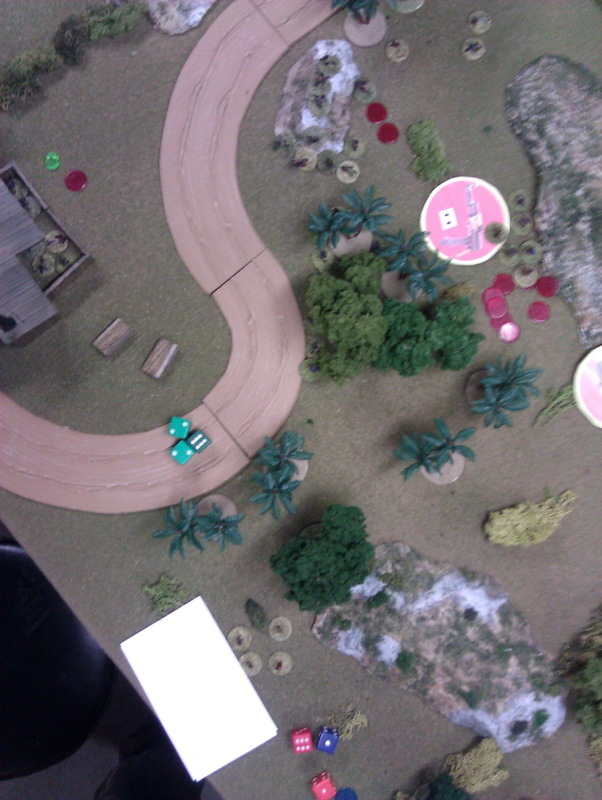 The IMC forces play their last Ace: two APCs full of fresh troops come off Blinds and take on the Guards. The sheer weight of fire drives off one squad of the elites: lots of hits but no one killed. Having spent every available Action on shooting, the IMC troops were literally left standing in the road, desperately hoping their card is drawn before the Government troops get a chance to return fire. While the IMC troops were taking on the guards, they also deployed yet another gun-armed armoured car firing at the T-55s. This was dealt with by an RPG shot from a fresh squad on the Hill of Blood. 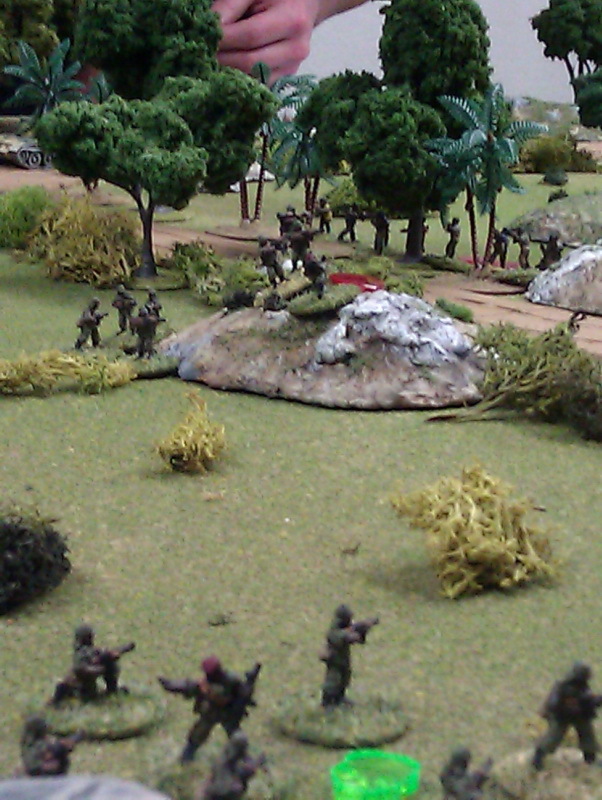 Another brutal firefight went on between the fresh troops shooting at each other across a narrow dusty lane. Casualties were heavy on both sides. The Government T-55's card came up first and it lashed the rebels with fire. The crew of the second T-55 are still claiming that they knocked out that last armoured car. Another Government squad being ground down on the Hill of Blood. A heavy toll was paid by any unit trying to hold this position. The rebels vainly fire an RPG at the T-55, and are subjected to return fire for their efforts. The general, too late to inspire the troops, finds himself alone in the open. 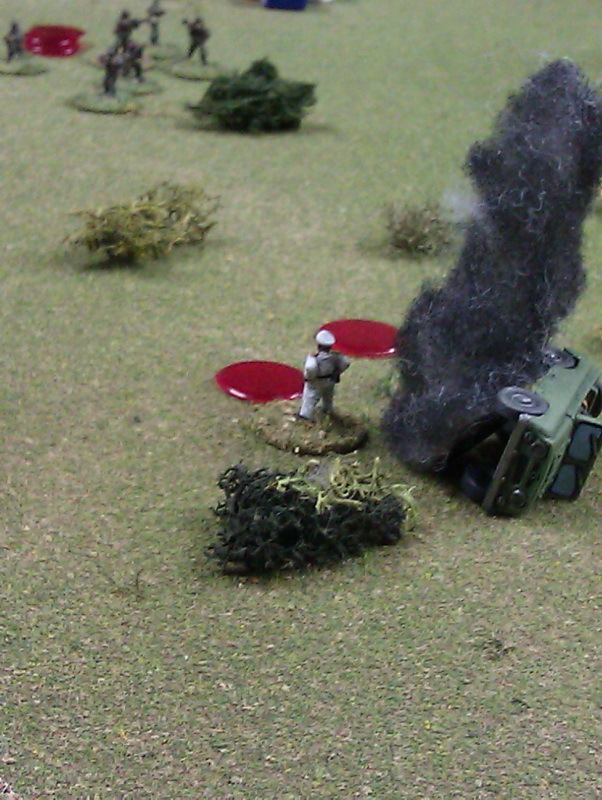 Enemy fire soon destroyed his truck and wounded the Exalted One and his driver. The T-55 rolled an eleven, at long last the technical is destroyed. The IMC APCs are destroyed by fire from the tanks and RPGs from the Guards, while the exposed squads are nearly abolished. Poorly supported attacks are a bad idea: the Government troops retire with a bloody nose. Unable to advance, barely able to fire, this squad would not be driven off. With their armour support gone, and very heavy casualties, the IMC forces retired to regroup. As usual, kudos to Pat for a well thought-out game with lovely terrain and all of those good-looking minis. For folks not familiar with the game system; the green chits you see in the photos are representative of held actions; the red ones are "wounds" which represent a combination of actual injuries as well as disorganization and loss of morale; blue chits show that the unit is suppressed (with much reduced fire and movement options); the green skulls show that the unit is taking fire (troops that are not being shot at are more effective than those that need to duck). Vehicle damage is detailed: you can be driven off by fire, have key personnel stunned/wounded/killed, parts of the vehicle can be damaged either temporarily of permanently. This sort of thing happened several times in this game: one of the T-55s spent a fair part of the game either retreating or moving back into position as the result of otherwise ineffective RPG and armoured car fire. Movement is random, each unit is assigned a card which are then shuffled and drawn, there are also two "sundowner" cards in the deck which when the second one is drawn show that the turn has ended. It is possible to go several turns without your card getting drawn, it is also possible for the last unit to move in one turn and be the first unit moving in the next turn. Some people do not care for this but I think it nicely creates the random chaos of modern small-unit combat. Certain powerful leaders get a card of their own and they can activate nearby units to advance the plan.